Coto de la serena golf course in Malaga. Golf in Costa del Sol, Spain. Coto de la Serena golf, designed by Pedro Moran Montero, was founded in 1991. 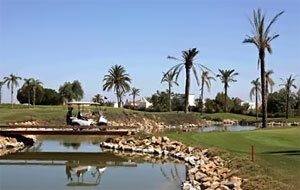 It is a semi-private golf course located in a residential area near Estepona. It's a small field of 9 holes, located in a relaxed setting on the Costa del Sol. The attractiveness of this golf course is in its design, with Japanese-style gardens and several winding streams, adding a touch of freshness to the attractive surroundings. Playing this attractive 9-holes par 3 golf course is a nice alternative to all other complete 18 holes golf resorts on the Costa del Sol. Accuracy off the tees is needed as the course winds through lush vegetation and is intersected by a winding stream. The club is private but open to visitors and green fee players are welcome. Address: Ctra. N-340, Km. 163,5. 29680 Estepona, Malaga. How to get there: Coto La Serena is located between San Pedro de Alcántara (Marbella) and eastern Estepona, next to the national road N-340, 82 km from Málaga.